I grew up in Nile Street, leading into Market Street, in the 1950s and 1960s. The southern end of Market Street always had a bombed-out appearance with the remains of the market used as a car park, and some small crumbling WWII concrete buildings. It was a weed-strewn wasteland, until the whole area between Black Lion Street and Market Street south of the Town Hall, was swept away in the disastrous 1984 redevelopment. Nile Street dates from the late 18c, being named after the Battle. Originally it consisted of small private houses, some of which are shown here. 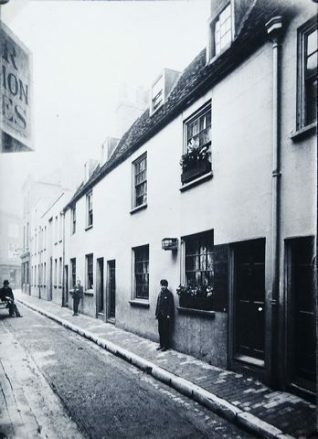 Gradually the street became commercialised, and in 1889 these houses were demolished, the site being absorbed into business premises. Roughly where Nile Street joined Market Street, on the opposite side of the road from Nile Street, was a cheap cider bar that in the early 1960s often had the odd late evening punch up. Next door, and to the south, was the Nanking Chinese Restaurant. It was a towering building that was gutted and turned into an up-market shopping arcade. I have been told that in 1947 or 1948, it was apparently the first Chinese restaurant in Brighton. I remember three generations of Chinese working and possibly living there. There used to be private Chinese New Year parties, with regular patrons invited, where your drink would be topped up with whatever bottle was to hand. Incongruously, next to the Nanking Chinese Restaurant, on the corner, was the SPCK Christian Bookshop. The Teds, Mods and Rockers often drank or fought in the cider bar. Usually they ate afterwards at the Nanking. You would certainly see some strange sights back then. Sometimes, having had too much to drink, they could be seen running up Nile Street to avoid paying, but pursued by cleaver-waving Chinese cooks. The Nanking Restaurant was where I ate Chinese food for the very first time. I would have been around around 10 or 11 years old (in 1959 or 60) and went with my parents and their friends. At that time wild rumours were common that whenever a Chinese restaurant opened in an area, the neighbour’s cats would go missing overnight! I remember liking the food nevertheless and when I began work went back fairly frequently. In the late 1960s, when I was studying at Brighton Technical College, you could get a quite decent business lunch there for 7/6d (37.5p). I did hear of people who ran out without paying and in fact knew people who knew people who had done it. I never had the courage to try. I’ve since eaten Chinese food all over South East Asia, as well as in China itself, and know that what we still get in this country today is a poor imitation of the real thing. When I got married, 1970, my new wife (only wife) and I had our honeymoon in Brighton. We ate every night in the Nanking on Queens Rd. The staff were brilliant and soon found out that we had just got married – my wife still has an advertising fan they gave her. They got so used to us that they would suggest meals for us. Really good memories of the restaurant. Peter Wood, as far as I am aware there was only ever one Nanking Chinese Restaurant in Brighton and that was in Market Street, more or less directly opposite where it meets Nile Street. 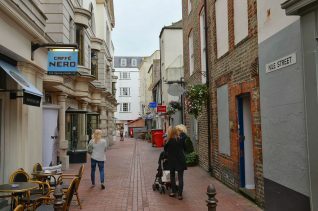 The restaurant used to sit exactly where the western entrance to the East Street Arcade is now and I know it was still there in 1970, as it was where I went in June that year to celebrate with friends after our final exams at Brighton Technical College. Kelly’s 1974 has the Chinese restaurants in Queens Rd as Cheungs at 6a, Chop Suey House at 58, and Mandarin at 62. All of these are on the west side. I think Cheungs is now still a Chinese but has been under many different names since the 70s.